WE HAVE MOVED! COME JOIN US IN OUR NEW LOCATION ON 3731 MACKINTOSH STREET (H.H. MARSHALL BUILDING), UNIT 2! 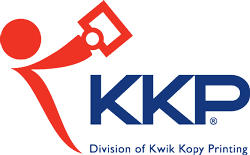 KKP Halifax, a division of Kwik Kopy Printing, is more then just a print shop. Think of KKP Halifax as your very own business services partner. From business cards to posters, wedding invitations to roll-up banners, your projects will be created by professionally trained experts and delivered by people who care. We're proudly pet-friendly and always enjoy new visitors coming by. Your printing and design needs has never been so easy, so come on in or email us with any questions and projects. As our motto states: "Yes we can!"